Anesthesia is a temporary condition caused by the special medical drugs, which interferes with the transmission of nerve impulses and is "disabled" the feeling of pain. There are 2 basic principle different types of anesthesia: General and local. A mandatory condition of General anesthesia is a patient's dream. In the method of administering anesthetic General anesthesia can be inhaled (endotracheal, mask), intravenous, combined. Inhalation anesthesia is a type of General anesthesia, in which drugs are anesthetics ("volatile", volatile liquids or gases) enter the body through the respiratory tract. 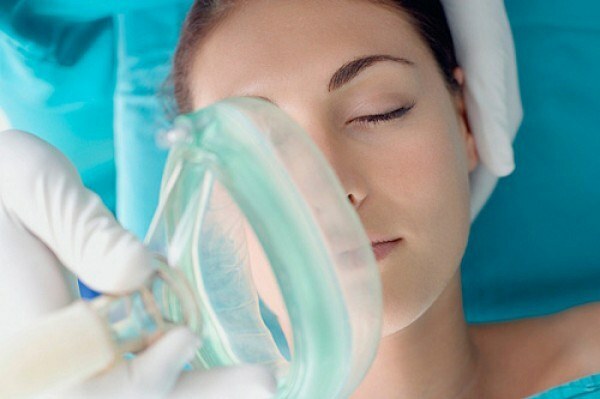 When carrying out mask anesthesia, the patient is breathing independently or gaseous drug mixture is supplied through a special mask under pressure. Used infrequently because of the high risk reflex respiratory arrest. Under endotracheal anesthesia, a special tube is introduced into the trachea through which the drug enters the respiratory tract. It is commonly used when conducting prolonged operations on the head and neck in cases when breathing is difficult (the position of the body on its side, stomach). The risk of aspiration into the respiratory tract of the stomach contents is very low. Non-inhalation anesthetics are administered intravenously or intramuscularly. Apply for operations lasting no more than 30 minutes, because it is a narcotic drug when administered intravenously, acts short-lived. Local anesthesia is performed in cases where it is necessary to anesthetize a specific area of the body (e.g. limb) for the implementation on this site of surgical intervention. After the drug is introduced, there is a violation of nervous impulse. The consciousness of the patient is saved, he is able to breathe on his own. - regional, the medication is injected close to the nerve trunk. and wire in which the anesthetic is injected closer to the nerve plexus, host, or peripheral nerve. Combined anesthesia is carried out using simultaneous or consecutive application of methods of one kind of anesthesia (inhalation and non-inhalation). For example, first hold introductory anesthesia with different drugs (sodium thiopental), and then proceed to intubation and basic anesthesia (neuroleptanalgesia or inhalation anesthetics). This kind of anesthesia is the most safe. In the case of application of combined anesthesia using both local and General anesthesia. With the help of local anesthesia can reduce or eliminate the occurrence of side effects of drugs, postoperative period proceeds more favorably.